I'm not sure what I was thinking when I suggested to Dee & Ann of Me Plus Food that we meet up at Elizabeth's Chalet for dinner. You see, we had been planning to find some interesting eats for a while now. A few places came to mind and finally we settled on Elizabeth's Chalet. Now, to be honest, I knew nothing of the place other than the fact that it seemed to have some good reviews. Of course, being out in Cloverdale made it an adventure in itself. Last time, I had a pretty decent experience at the Vault nearby. 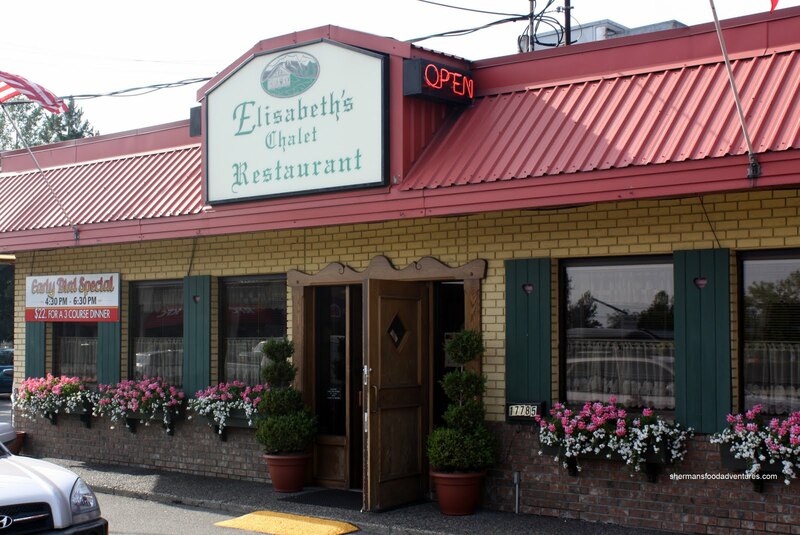 Now where the Vault is both eclectic and trendy, Elizabeth's Chalet is not. I arrived a little early and as I walked in, I was stunned for a few seconds. No, it wasn't a blast from an Imperial Storm Trooper; rather I suddenly felt a whole lot younger. When Dee and Ann arrived, the hostess immediately pointed them in my direction by default. Why? Let's just say I stood out like a dandelion on the 18th fairway at Pebble Beach. Looking very much like it has been stuck in a time warp since 1980, Elizabeth's Chalet has a homey feel to it. From the pink tablecloths down to the Victorian floral print on the chairs, the place is classy in its own special way. I found that the service was quite good. In fact, the assistant waiter knew the proper etiquette, which is a whole lot better than some other places I've been to in Downtown. While Ann and Dee chose to go for the Early Bird, I went for a la carte. Reason? For variety of course! 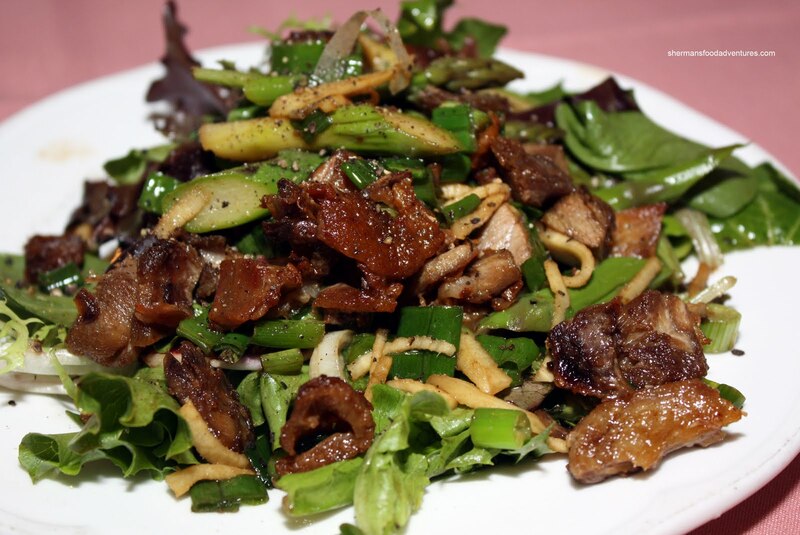 I started with the Warm Duck Salad. The salad was quite decent. The pan fried duck pieces were generally good with a definite soy taste. Some bits were a tad chewy probably because the duck fat had been fried until it was crispy/chewy. I found that the dressing (or the duck fat from the pan frying) made the salad a tad greasy. Dee and Ann decided to go for the Early Bird for $22.00. 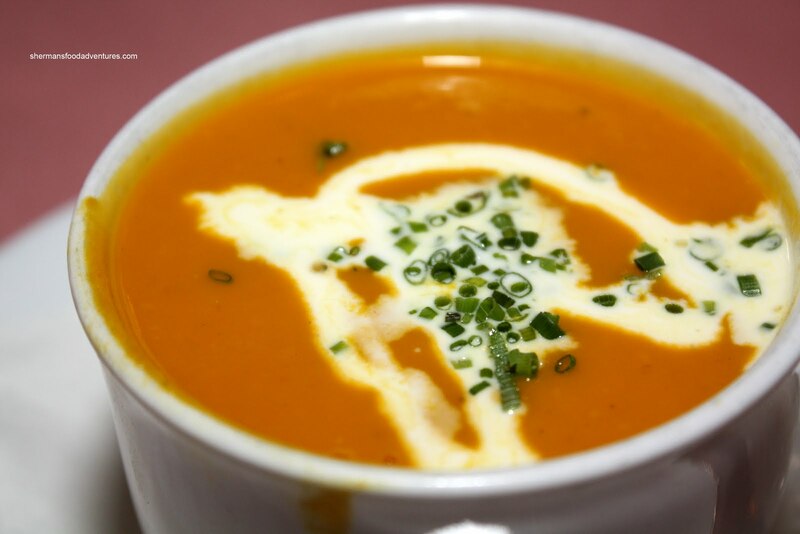 Dee started with the Carrot Ginger Soup. He thought it was not nearly as good as what he had at the Cannery. It was decent though with a smooth texture while the flavors weren't too strong. Yet, he couldn't really tell it was carrot besides the color. 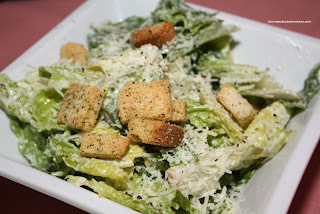 Ann went for the other appetizer option - Caesar Salad. Yah, nothing much to get excited about really. It was your typical standard Caesar Salad. Pretty solid nonetheless. For my main, I went for the Prime Rib special @ $13.95. 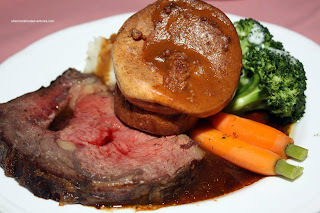 A perfectly medium-rare prime rib resided on a plate complete with mashed potatoes, broccoli, carrots and Yorkshire pudding. Most parts of the prime rib were tender with the rare portion being a tad chewy (which is pretty standard). The mash potatoes were very fluffy and buttery. I liked it. The veggies were still a bit firm which was nice. The au jus was understated with some meat flavour, it didn't overpower the natural flavour of the prime rib. Continuing on the meat theme, Dee had the 6 oz Sirloin. Definitely a bit tougher cut of meat compared to the prime rib. It was cooked medium rare, but was tougher to chew. It was topped with a ton of good mushrooms. 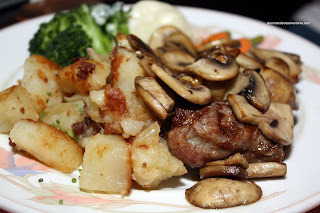 He liked the home fried potatoes were good, half-crispy house potatoes. The broccoli, cauliflower, and carrots still had a crunch to it. Dee suspected they were steamed. The cauliflower had a bit of sauce on it, but he couldn't taste it. It was kind of bland. Ann ended up with the other choice for the early bird being the Red Snapper Four Seasons with mashed potatoes and fresh veggies. The premise of the sauce are the veggies representing the four seasons, consisting of tomatoes, olives, celery and onions. I got to sample the fish and I thought it was cooked quite nicely. The fish was still moist and flaky while cooked all-the-way through. I wasn't so sure about the sauce. I found that the fish got lost in the tartness. 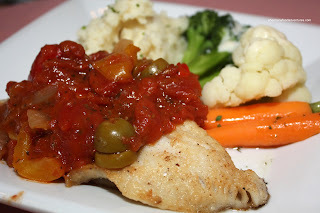 Rather than letting the fish shine (although snapper is mild-tasting), all I could taste was sauce. Mind you, that might've been the intention. As mentioned before, the veggies and mash potatoes were good. For dessert, Ann had the Lemon Cake. 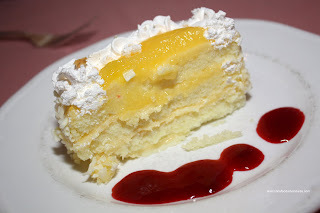 I found the cake to be quite sweet with not much lemon flavour. It was actually quite dense despite its light appearance. Dee had a slice of the Strawberry Rhubarb Pie. We both thought that the filling was quite good balancing sweetness with tartness. However, the crust was not flaky at all. It was dense and chewy. Overall, the food at Elizabeth's Chalet can be summed up as traditional. The place is the antithesis of modern and trend-setting. It is a place that represents yesteryear and doesn't apologize for it. We were not their target clientele; yet the food was decent. For the prices they charge, especially for the specials, it is a bargain. Portions were good, service was friendly and stares from the older patrons were priceless. So that's where you guys went that time! Hey, at least, you were guided there and that odd vibe you got when producing the camera (you know, like some late night eats or some places in Surrey!). it was totally fun eating with you there. I had fun experiencing fine dining in my parents' time. "I suddenly felt a whole lot younger." Your age (young man) may be why you felt like that dandelion! Last time I was there, it was a much older crowd! Perhaps an age demographic rather than one of ... er ... "complexion" ...? If not, then you have some insight into being "gwai lo" at many dim sum establishments ... LOL! this is the only type of place where i will eat alone. some kind old woman will invariably ask why a lovely young lady such as myself is alone and suddenly i have a dining companion. :P the price is usually right too. Nice way of looking at it Trisha!